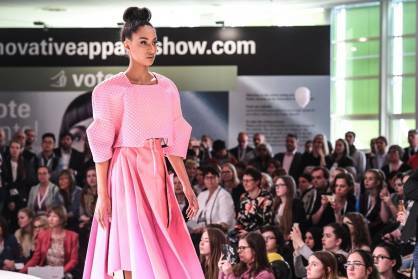 The award-winning projects were chosen by the visitors of the two leading international trade fairs who, during the first three days, had the chance to vote for the models they liked the best using an app or at the catwalk. The winners were presented with cash prizes totalling € 3,000. The Innovative Apparel Show during Techtextil and Texprocess presents new garment textiles and innovative processing technologies in the form of a fashion show. With live shows twice a day, visitors had the chance to see visionary fashion designs, made of technical textiles and produced using modern processing technologies, by students of four international design universities. This year, the universities were Esmod from Paris, ESAD College of Art and Design from Portugal, Accademia Italiana, Florence, and Hochschule Trier. Pic:‘Momentum 1’ was the name of the model by Mariana Almeida from Portugal, which received two awards. Photo: Pietro Sutera.